Ayisa Adderley and Caige Crampshee met in college. Not the same college, but college none the less. “It was a whimsical kind of thing; we had always wanted to do music and I’ve always wanted to be in a band but I never thought that I could start it myself until a couple of years ago,” Adderley said. 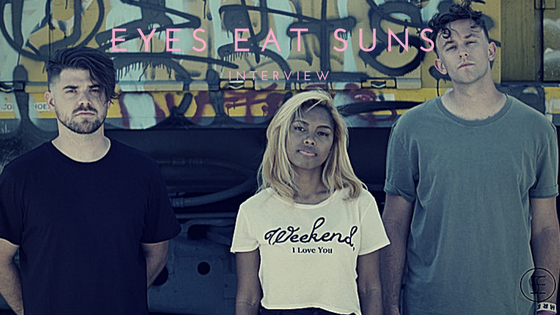 Their band, Eyes Eat Suns, started in 2013 and was “a happy accident” as far as naming the band. When trying to come up with ideas while sitting at the mall waiting for a friend to clock out from work, she decided to use wordplay. Eyes Eat Suns was one of the first that came to mind, playing off of her first name. Adderley always had a love for music, thanks to her mom. However, when asked about her musical influences growing up, she had an unorthodox response. Eyes Eat Suns already has Warped Tour and Weenie Roast added to their resume, thanks to Battle of the Bands competition. They’ve also already released two EPs as a DIY band. The band’s second studio EP, Alive, was released earlier this year and was produced by James Paul Wisner – yes, the same James Paul Wisner that has worked with bands such as Underoath and Paramore. They were introduced through mutual friends and felt that he had just the vibe they were looking for. “It didn’t sound like he wanted to sell us anything; he was very genuine and wanted to help us,” Adderley said. They also just released a music video for their song, “Priceless Faces”. Jonathan Howe directed the video and came up with the simple concept of focusing on the music. The shots are very candid shows how effortless the band’s chemistry is. “He wanted to keep it very playful and keep the focus on the music as a band and not take too much away from the song by making it a cinematic thing. Since the song itself is just about our experience as a band and playing shows and meeting new people, we wanted it to be just the band,” Adderley said. Although this is just the beginning for Eyes Eat Suns, the melodic alt-rock sounds of Adderley's voice and Crampshee's guitar are sure to catch attention.